You are here: Home 2017 May 802.11ax? What is 802.11ax? What is 802.11ax? How does it compare to 802.11ac? Here we will share some fast Q&A to tell you what the 802.11ax is. In any case, 802.11ax is the next wireless communications standard in the IEEE’s long-standing series of 802.11 standards, which form the basis for the technology we generally just call Wi-Fi. 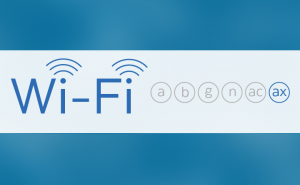 Like 802.11ac, the new 802.11ax is backward compatible with previous Wi-Fi generations. However, it’s the first standard that focuses not only on faster speed but also on Wi-Fi efficiency, or network capacity, especially in crowded air space. This means 802.11ax allows for faster real-world speed than previous standards. 50 different gadgets all demanding a slice of the internet pie shouldn’t be a problem at all, even if they’re using a large amount of data. That said, on paper, 802.11ax can be four times faster than 802.11ac. Also, an 802.11ax router helps existing pre-802.11ax Wi-Fi devices have faster speed thanks to its ability to manage traffic diversity and overcome the density of overlapping networks. Q: Ready for some techy specs? 802.11ax works on the 2.4GHz and 5GHz bands, and it introduces OFDMA (which stands for the catchy Orthogonal Frequency-Division Multiple Access). This basically helps to reduce the amount of interference from other nearby WiFi networks, by using finer channels. Correct. It’s a work in progress, but it’s got a lot of exciting new capabilities – 802.11ac broadened the multi-antenna capabilities (MIMO, or multiple input, multiple output) introduced in 802.11n, but 802.11ax will be able to subdivide signals even further, using a technology called MIMO-OFDM. Q: Sounds good –802.11ax coming? 802.11ax vs. 802.11ac: What’s the difference? 802.11ax timeline: When will 802.11ax devices and routers come to the UK? Qualcomm has just launched the first two 802.11ax compatible chips – the IPQ8074, designed for use in routers, and the QCA6290 designed for use in connected devices such as phones and tablets. However, even though these chips are now a reality, there is no estimated arrival date for the first 802.11ax routers and devices. Hardware standardisation should be done by summer 2017 according to Qualcomm, so the first 802.11ax routers could be released in the UK and worldwide as early as second half of 2017. Otherwise, 2018 is a safe bet. 802.11ax will also be coming to the automotive industry soon, so you can expect to see cars with 802.11ax networking capabilities in the next year or so. Qualcomm says the IPQ8074 is a highly-integrated all-in-one platform designed for access points, gateways and routers. The 14nm chip integrates an 11ax radio, MAC and baseband, and a quad-core 64-bit A53 CPU as well as a dual-core network accelerator. It uses a 12×12 Wi-Fi configuration (8×8 on the 5GHz band and 4×4 on the 2.4GHz band) and supports MU-MIMO for uplink. As a result, it can deliver up to 4.8 Gbps while maintaining fast connections over a larger coverage area than any 802.11ac chip. The chip also features Qualcomm’s Wi-Fi Self-Organizing Network (SON) which simplifies installation and optimizes traffic. On the client side, Qualcomm says the QCA6290 SoC can offer up to a 4x increase in throughput speed in a crowded network. It supports 2×2 MU-MIMO and can realize the full benefits of the 8×8 MU-MIMO thanks to its 8×8 sounding mechanism. The chip can combine 2.4GHz and 5GHz bands using its Dual Band Simultaneous (DBS) feature to deliver up to 1.8 Gbps Wi-Fi speed. Compared with 802.11ac, the chip can reduce power consumption by two thirds.